It seems like almost every day there is news somewhere in Chicago and Illinois about a tragedy involving a commercial bus, a school bus, or a bus van. Unlike car accidents, when a bus becomes involved in a crash it is inevitable that its occupants will be injured. Both school buses and commercial buses are reporting a higher rate of crashes. For school buses, the majority of these collisions occur because of the negligence of drivers of other vehicles. Under Illinois law, school bus drivers are required to follow a higher level of care and safety than other bus drivers. For example, an Illinois statute (625 ILCS 5/11-1423) governs how a bus driver must assist and direct students getting on and off the bus to ensure their safety. On commercial buses used to transport people either within an area or across the country, most passengers are injured or killed because of lack of seatbelts. In a time when seatbelts are required in cars, trucks, and airplanes, buses seem to stand alone with regards to their lack of seatbelts. If you or someone you know and love has been injured or killed in a bus accident, contact our offices at 312.346.0045 or toll free at 800.583.8002 for a free and immediate consultation, or fill out our contact form online. 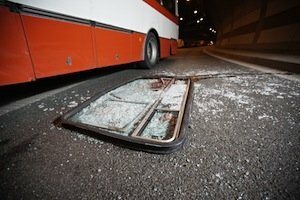 With more than 40 years of trial experience in handling catastrophic injuries in bus related crashes, Kreisman Law Offices can help you obtain the justice you deserve.